Learn how to use PECS pictures for children with autism symptoms or delayed speech. PECS training is a great way to teach how to effectively communicate and helps to avoid temper tantrums or other aggressive behavior in children due to limited verbal behavior. Autism treatments may also involve the use of communication pictures to provide kids with a picture schedule to know what to expect each day. These can be used with all kids. We use one with our son and have found it to be a huge help in developing independence. Because the pictures can be so expensive, I have provided a page describing a cost effective way of how to get a PECS system. So, be sure to check that out as well! The following will provide you with an idea of how children are taught to use PECS to communicate. It progresses in phases as the child becomes more advancde and can take time, but once they are being used effectively, it makes a huge difference in that child's life. The first step is to encourage spontaneously requesting items or activities. This may require two people. 1. Identify what your child wants. Find the things that are typically "asked" for. ie- a favorite toy. Show something that he/she really likes. 2. Wait for him/her to reach for the item. Then prompt your child to pick up the picture of that item and hand it to you. 3. Then immediately give the item requested. 4. Provide verbal confirmation and praise. (ex. "Oh, you want car. Good job asking for the car!"). 5. You may prompt to say “car” also. 6. Slowly fade the prompt to pointing, working towards independently reaching for pictures and handing it to someone. Try not to ask what your child wants or encourage which pictures to choose. The goal is to spontaneously initiate communication. Once your child understands phase I, and can independently make a request, Pecs Phase II should be started. 1. Your child should continue to request items or activities, but require him/her to move a greater distance to get to the picture or to get to the person he/she is making the request to. 2. Eventually you will begin to use the PECS pictures in different settings (at grandmas or in a different room). Then with people other than the initial trainers. (parents, teachers, siblings, other family members). 3. 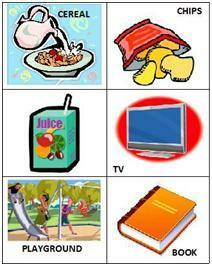 You should also begin expanding his/her vocabulary of symbols, requesting different reinforcing objects or activities. At this time only one picture should be offered as a choice. Once understanding phase II, and being able to independently make a request, Pecs Phase III should be started. Ask to choose between several items on a board, working toward making personal choices. You may begin by asking, "What do you want?" but this should be quickly faded out so choices are made spontaneously. If it is too difficult to choose between too many PECS pictures, reduce the number of choices to 2 or 3, and work towards a larger number.